Ever since Congress lifted the ban on U.S. oil exports in 2015, it’s been no surprise that our tight oil resources have accounted for the lion’s share of growth. To be perfectly clear, 6 out of every 10 barrels of oil extracted from beneath U.S. soil comes from just one of three oil regions. Again, it’s not shocking that we’ve gotten to this point. We’ve been banging this drum for more than a decade, and the veteran members of our Energy and Capital investment community know the kind of opportunities that lie ahead. You see, we’ve gone far, far beyond a simple oil boom. We’re now transitioning into a global energy powerhouse. Call it what it truly is: a perfect storm for investors! Right now, approximately 47 barrels of oil being extracted from the Permian Basin EVERY SECOND! And that’s only going to increase as more drilling rigs are deployed to the area. But I want you to fully understand the kind of output we’re talking about here. At that rate, more than 4.1 million barrels of crude are flowing out of Permian wells each day. 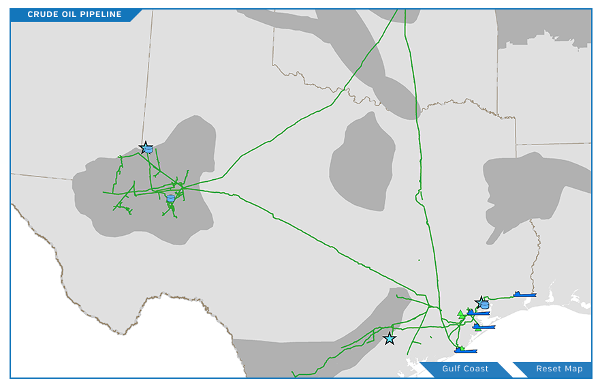 By the time the 2019 summer driving season kicks into high gear in a few short months, the Permian Basin could be supplying well over 4.3 million barrels per day. That’s MORE crude oil than the entire United States was producing in September of 2005! Yet, this flood of crude oil flowing out of these tight oil plays came with some serious benefits. Between 2005 and 2015, our crude oil imports plummeted by nearly one-third. More specifically, our imports from OPEC plunged by almost one-half. That’s when Congress lifted the 40-year ban on oil exports, and the game changed dramatically. At first, only a small trickle of crude started flowing out of the United States. In a special report released by the EIA on April 15, 2019, we learned that U.S. oil exports averaged 2 million barrels per day in 2018. And our list of oil clients grew to 42. Six of our 10 largest buyers were in Asia. By 2020, U.S. exports of crude oil are projected to more than double to 5 million barrels per day! In fact, the EIA is even projecting U.S. oil exports to top 9 million barrels per day by the mid-2020s. Keep in mind that ONLY Saudi Arabia and Russia would be able to put more crude on the global market. But there’s one slight catch to this story. In order for oil companies to achieve this goal, the industry is going to have to spend billions improving one critical piece to this oil boom. And that, dear reader, is where individual investors like us will reap windfall profits from a dirty little secret in our future oil exports. Regarding U.S. oil exports, would it shock you to learn that more and more investors are finally taking advantage of the situation? No? Me either. Remember, it took less than a decade for drillers in the lower-48 states to do a u-turn on production and push U.S. output to record levels. However, had I told you on April 1, 2008 that oil companies would be pumping 12.1 million barrels per day, you would have laughed me out of the room… and for good cause, too. But oh, what a shale boom can do, folks. Any investor with a dime in the oil sector already knows how the shale boom caused U.S. production to explode higher. We just talked about the u-turn that took place in our domestic output over the last decade. Naturally, if you’re starting your search for the right Texas oil stock, the best place to look is in the Permian Basin. Not only do these companies have a geographic advantage over the rest of the sector due to their proximity to the Gulf of Mexico, but they are also the most cost effective when it comes to extracting oil out of the ground. But here’s the dirty little secret: We don’t need $100 oil to profit from the U.S. oil export boom! In 2018, Texas drillers were producing a barrel of crude between $21 and $48 per barrel. In fact, Permian Basin oil companies were extracting crude for around $26 per barrel. The first is one of the best — if not THE best — independent driller in the Permian Basin: Pioneer Natural Resources. Pioneer’s impressive acreage position consists of approximately 680,000 net acres in the Midland Basin. Their low-cost, high-return wells has pushed the company to the very top of the list, as Pioneer’s 389,000 barrels per day is currently the largest of any operator in the Midland Basin. In fact, Pioneer can extract one barrel of oil equivalent in the area for just $23, which means this company is operating in one of the lowest break-even plays in the United States. As of December 31, 2018, Pioneer’s proved, undeveloped reserves stood at approximately 55 million barrels of oil, 24 million barrels of NGLs, and 142 billion cubic feet of natural gas. But the value here is more than simply the break-even costs, Pioneer Natural Resources didn’t pay much to acquire its acreage. Since 2016, Pioneer’s average cost basis for its undeveloped acreage was approximately $500 per acre. To put a little perspective on this, some other companies in the Permian Basin have been paying out tens of thousands of dollars for their land positions. In 2018, Pioneer Natural Resources earned $6.31 per share, and it is expected to generate $7.10 per share in 2019, and then $9.63 per share in 2020. Of course, this is assuming the company isn’t bought out by even bigger fish in the Permian Pond. In April of 2019, Chevron made a stunning move when it bought Anadarko Petroleum. Not only did Chevron want to consolidate their Permian position, but they were more than willing to pay out a huge premium for it — roughly $50 billion! Is it only a matter of time before Big Oil starts sniffing the waters around Pioneer? Perhaps, but Pioneer isn’t alone in churning out Permian profits. Patience is a virtue, especially when it comes to investing. Sometimes you have to play the long game to come out on top. And that’s precisely how a small group of investors is taking advantage of Texas’ energy boom. A recent report by IHS Market concluded that in order for Texas to hit its full potential for oil and gas production growth, nearly 11,000 miles of new, unplanned pipeline will need to be built over the next 30 years. In case you’re counting, that’s roughly 20 new projects that need to come on-line. Falling short of those targets could curtail oil and gas production growth by 9% and 24%, respectively. But we’re talking more than pipelines, dear reader. If drillers in West Texas have any shot of boosting production to 5.5 million barrels per day over the next 10 years, a host of new infrastructure will need to be put in place — from refineries to more ports along the Gulf of Mexico. Consider it the greatest U.S. energy build-out in history. And Enterprise Products Partners is playing a big role in getting Texas oil to both domestic and global markets. Over the six years alone, U.S. oil exports are expected to surge to nearly 8 million barrels per day. That’s more than Saudi Arabia is currently exporting. At this pace, the U.S. is expected to become the world’s largest crude oil exporter by 2025. But again, this simply won’t be possible without the necessary infrastructure in place. You’re not going to want to sit on the sidelines for this one, trust me. All that’s left is targeting the right opportunities.